Meet at 6:30 p.m. and enjoy comfort food, conversation, and comradery! We meet the 2nd and 4th Tuesdays of each month at 6:30 PM. Please see our calendar for service projects and other activities. New Pres. Elect. 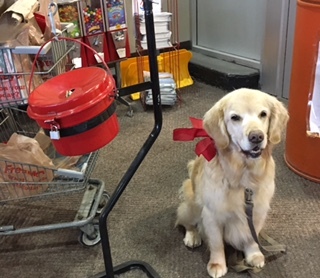 Kathy Heindl at PETS! 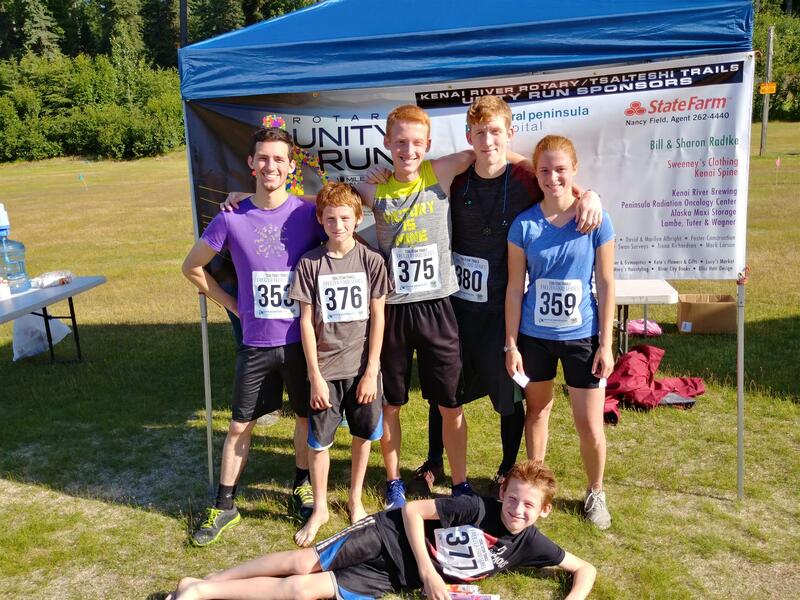 This year's Unity Run was a big hit with the addition of a family friendly 1 mile run. The weather was beautiful, and we had a great turnout from our community. Wow! What a beautiful week-end for the Salmon Festival. 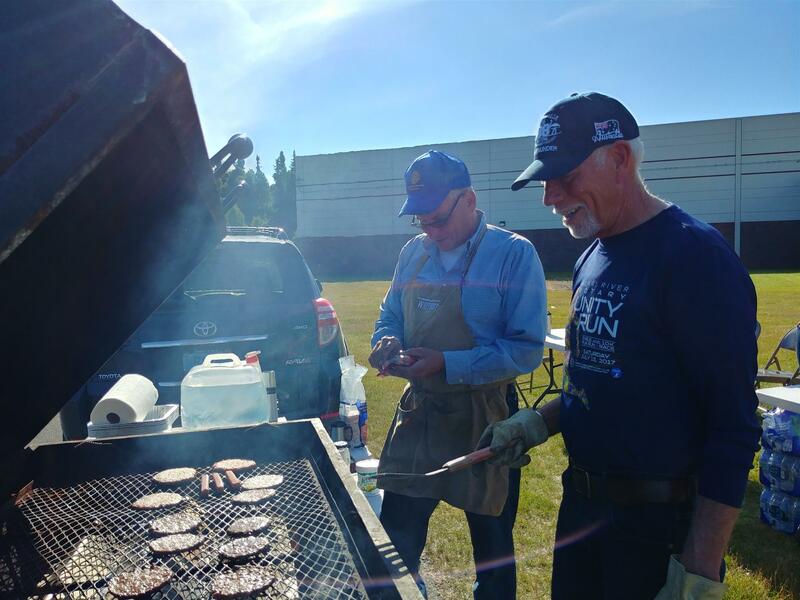 A big thank you to the Kenai River Rotarians who spent part of the lovely week-end grilling and serving delicious Copper River Salmon Dinners. Diane, sister Tracey, and Marilyn worked Friday evening, Bill and Connie volunteered on Saturday. Thanks folks for your service. 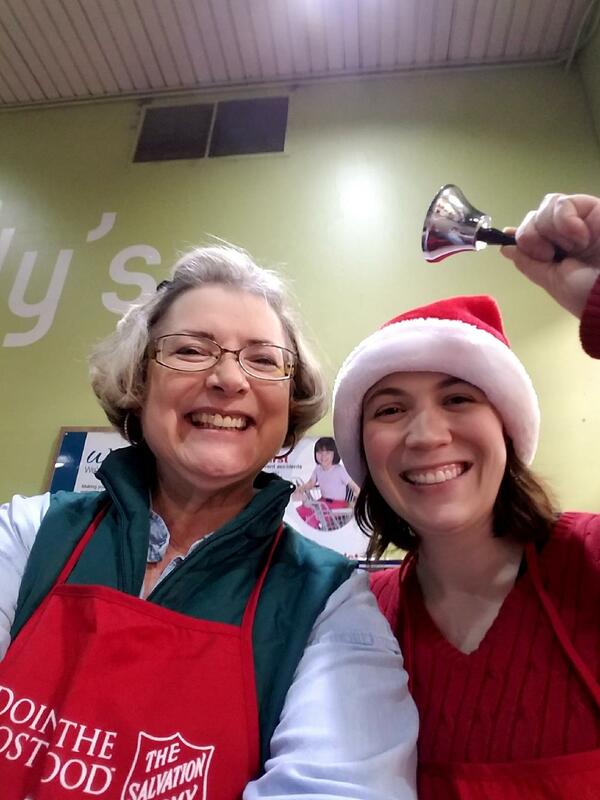 Recently Kathy Heindl participated in yet another community service. 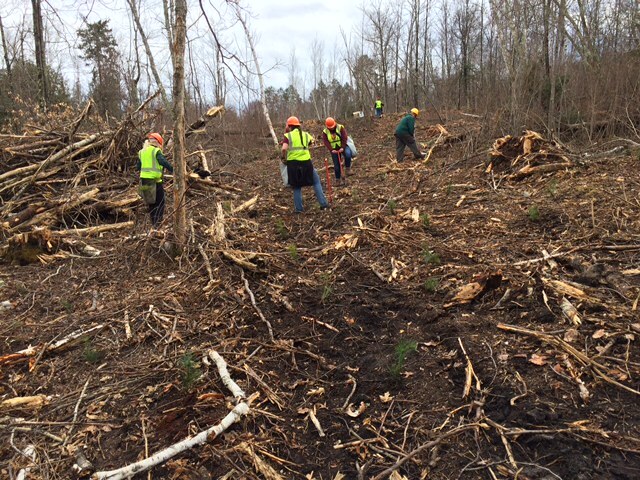 This time she traveled to Minnesota to assist in a giant tree planting project in the Chippewa National Forest. 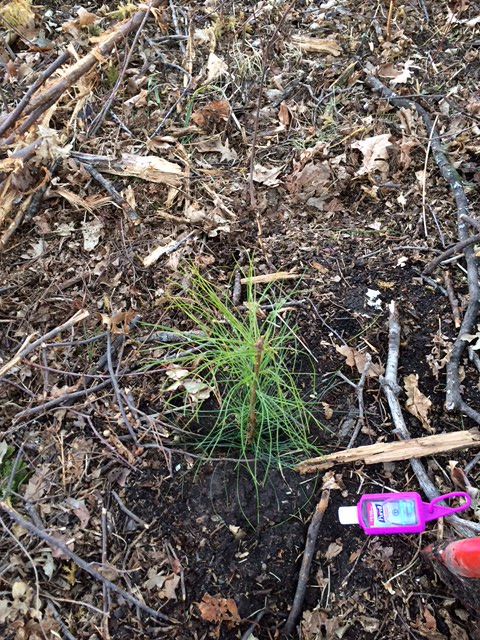 She learned about reforesting and how you have to cover each and every tree top to keep the deer away. 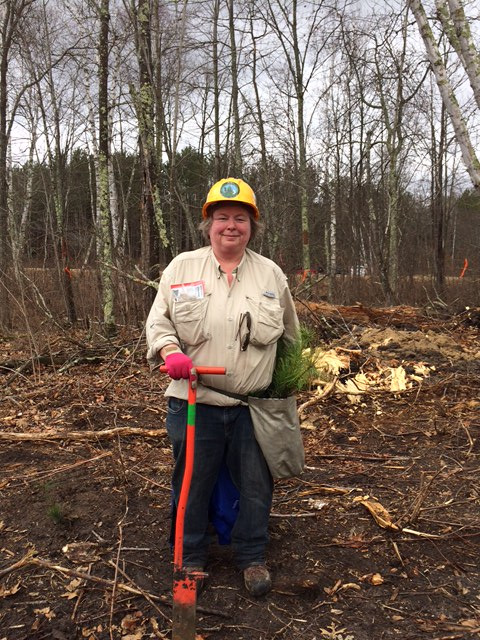 Kathy, along with other volunteers, planted 4000 trees. If you are interested in just how to do it, Kathy has the answers. Kathy and U of M students planting trees. Kathy, with her dibble stick. One of Kathy's trees. Maybe she will go back to visit it! 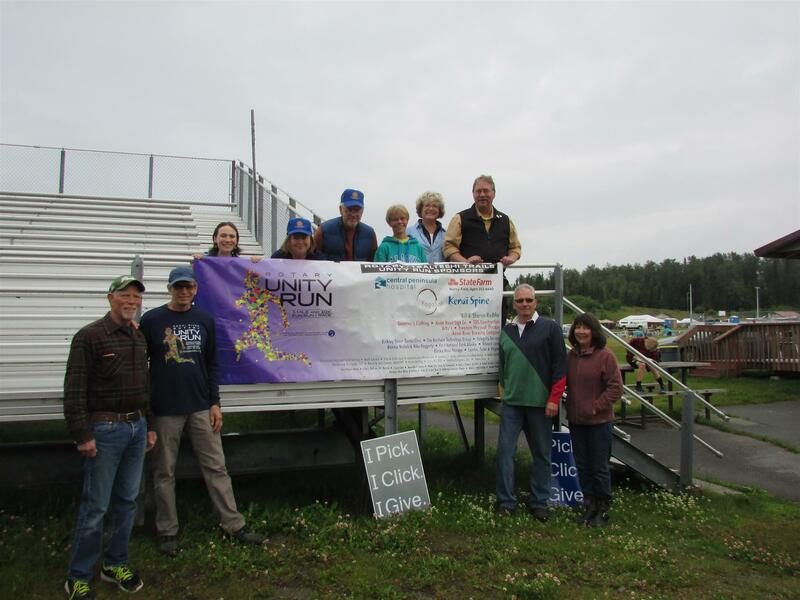 The Kenai River Rotarians are proud to haveKathy as a member of the club and thank her for another great project. 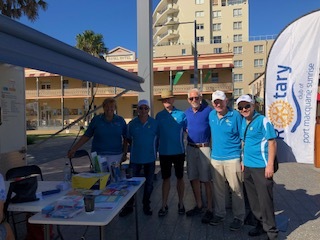 While camping in Australia Bill Radtke was lucky enough to run into some Rotarians from the Port Macquarie Sunrise Club while they were out service in their community. The next morning he attended the meeting. 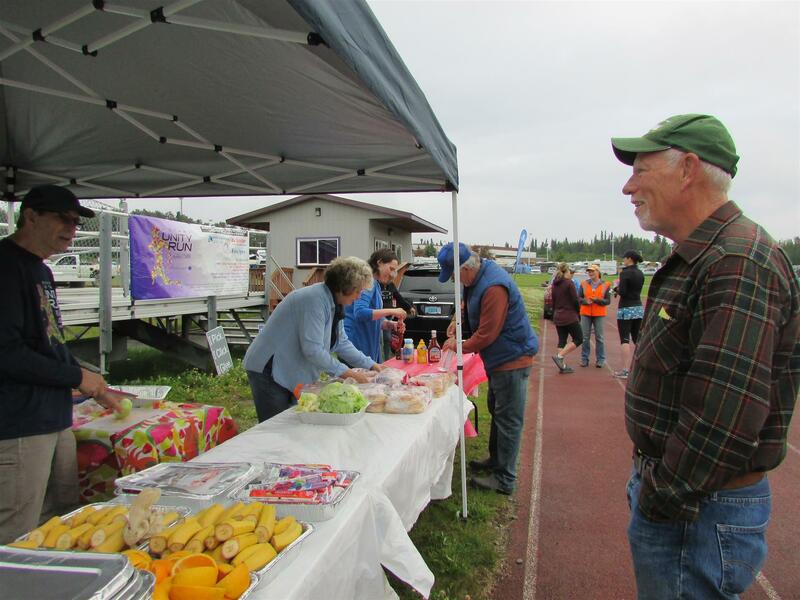 "What a great way to meet special people and get to know a community" Bill said. He added that he will make a point to visit more clubs in the future. Bill visiting with Rotary group doing health checks in the community. 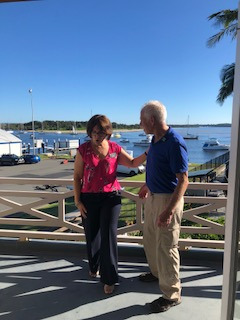 Bill visiting with the president of the Port Macquarie Sunrise Rotary Club. US Senator Dan Sullivan came to the Kenai this week and made time in his busy schedule on Monday January 15th 2018 to have lunch with a gathering of Kenai, Soldotna, and Kenai River Rotary Club Members. Kenai River-Soldotna Rotary President Doug Field is seen here chatting with the senator during the meeting. 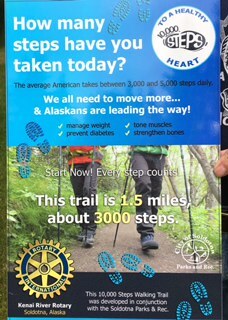 Today Bill Radtke was able to post the "10,000 Steps to a Healthy Heart" poster along with a TRAIL MAP Box. 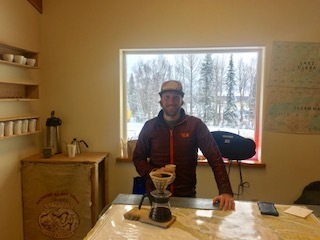 You will find the new additions to the Kiosk at the beginning of the trail by the Sports Center. Still to come from Parks and Recreation - a large trail map at the kiosk and trail distance markers along the trail. Rotary is making progress. Thank you Bill. For the December 12th meeting Rotarians met at Bill and Sharon's for a potluck dinner, delicious homemade eggnog, (thanks to Diane!) fun socializing, and great musical entertainment (thanks to Bonnie). It was fun to socialize; everyone enjoyed the surprise visit by Sylvia Reynolds. Another fun evening with good friends. 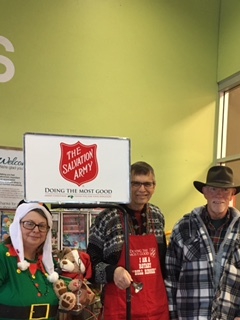 All through the afternoon and into the evening Kenai River Rotarians rang the bell for Salvation Army. Late in the day Nancy Fields and Esther Chambers joined the fun. The Elf, Kathy, was back to close out the day. Thanks ladies! Great job. 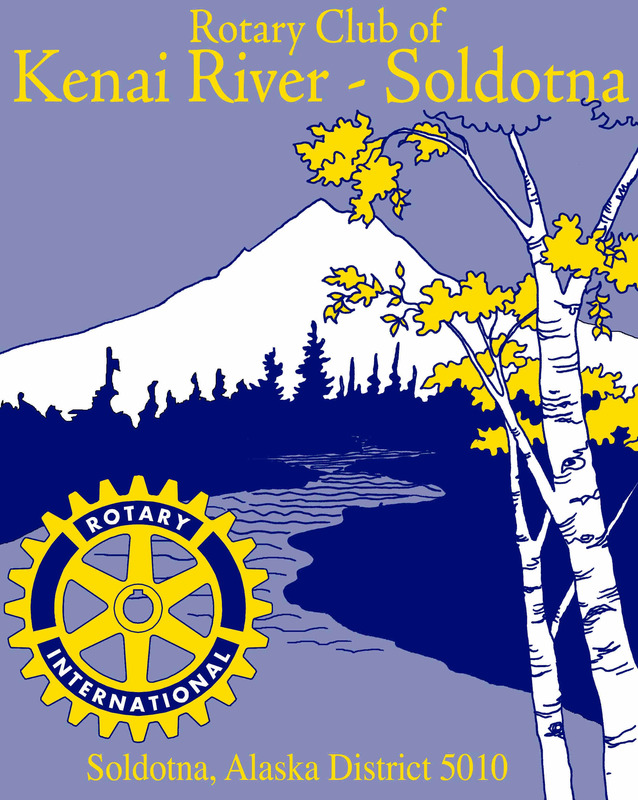 On October 24th Andrew Carmichael, Director of Soldotna Parks and Rec., visited Rotary to speak about the use of City Parks and Recreation areas in Soldotna. It was interesting to see just how many folks use the parks and river for far more than fishing activity. The statistics helped all of us Rotarians to realize the amount of money tourists bring into our community. 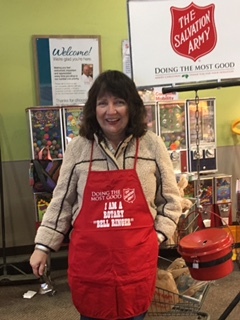 On Saturday, December 2, 2017, Kenai River Rotarians gathered at Fred Meyer's to ring the bell for Salvation Army. The day was a big success. Thanks Rotarians for helping out. 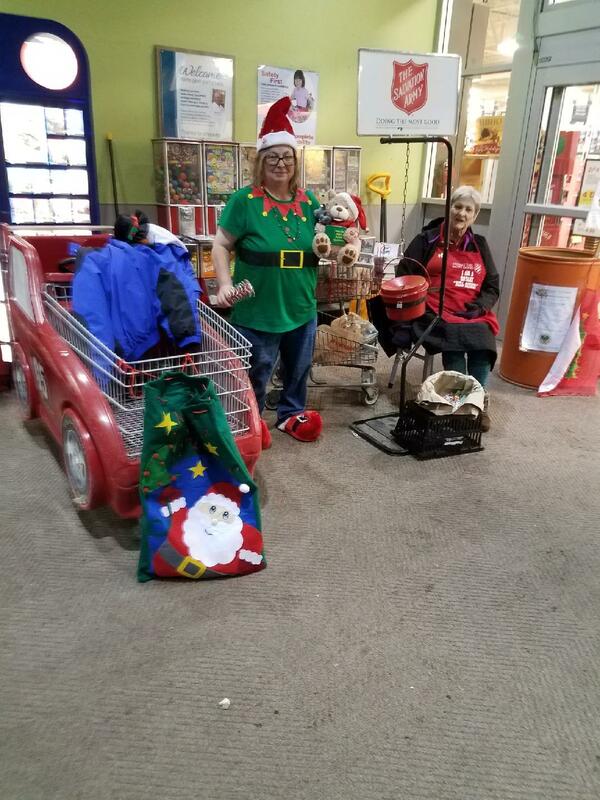 Kathy helped everyone get in the spirit of giving by arriving as an Elf with music and teddy bear. A happy group of bell ringers. She was petted, kissed, hugged and posed for selfies. During Bill Radtke's year as Rotary President one of his goals was to establish a walking trail to encourage a healthy lifestyle. Today Bill delivered the 10,000 Step Poster to Andrew and Joel and Parks and Rec. Soon a map and brochures will be added. The information will be posted in newly built kiosks placed at the head of the trails. This year's Unity Run was a little smaller than some past years but all things considered it was a big success. Thank you to our club members and the volunteers from Tsalteshi who worked so tirelessly to make it all happen. KHLT was honored to crown Kathy Heindl of Kenai yesterday as a Kenai Peninsula King Maker! 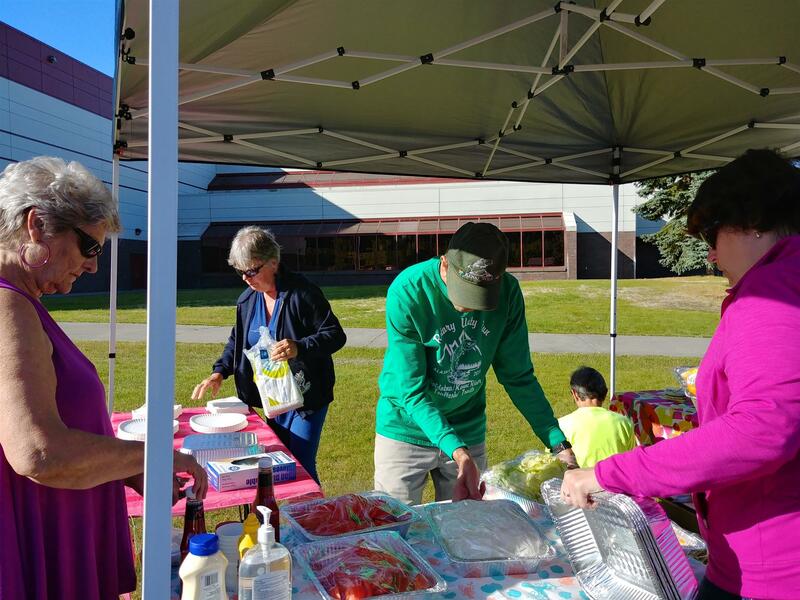 Kathy has dedicated countless hours of volunteering through Kenai Watershed Forum’s Stream Watch program over the last several years. From Centennial Park, Moose Range Meadows, Kasilof River, to Bing’s Landing, it is her selfless actions that help protect the vital habitat needed for salmon to live and thrive. Kathy’s dedication and commitment in caring for salmon streams is inspiring! Each one of us as individuals can take action. Taking simple steps will help ensure salmon will be on the Peninsula far into the future. The King Maker Program recognizes individual Alaskans, from landowners to schoolchildren, making a difference for salmon. The goal of King Maker is to share with people the value of protecting habitat critical to salmon, helping to ensure long-lasting conservation. 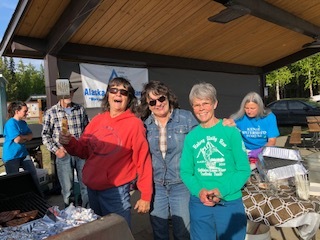 The rain didn't stop Kenai River Rotarians from enjoying themselves on Tuesday evening as Bill said good-bye to a great year as president and welcomed Doug Field with a gavel. With Brats in hand, Bill says good-bye. Doug, with support team beside him, says hello. President-Elect Rachel with little helper Ender. Every one enjoyed a social time together with good food and lots of conversation. Connie, Esther, and Marilyn enjoy dinner. Mike and Bonnie arrived just in time for dinner. Nathan, Kathy, and Diane kept the conversation going at the table. Even the little ones joined the good time! Rachel and Ender enjoy a moment together. Escher Nash was the perfect guest all evening. The evening entertainment was very special! Bonnie, just after winning a first place award for her song writing, played her guitar and sang for us. What a special treat! The rain finally stopped and a few folks enjoyed a little time outside. 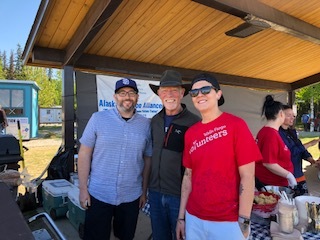 On the evening of June 20th we met at the Kenai River Brewing's new location between Walgreen's and Soldotna Creek Park. Owner, Doug, gave us a very complete and informative tour of the property, explaining the process of making beer. Everyone enjoyed ordering delicious food and getting a chance to try some of the beers on tap. After the tour everyone had a chance for dinner and friendship in the beautiful building. Marilyn Albright and Diane Taylor (hiding behind Marilyn) volunteered at the Food Bank's annual fundraiser Clash of the Culinary Kings. Thanks Marilyn and Diane for your continued community spirit! On Tuesday evening, May 9th, Rotary members met at ARC Lake for the annual clean up. Many hands make light work - well, maybe not light work but there was lots of work to be done. The group, Bill, Kathy, Diane, Esther, Marilyn, Dave, Tom and his wife collected nine bags of garbage from the picnic area and entrance. 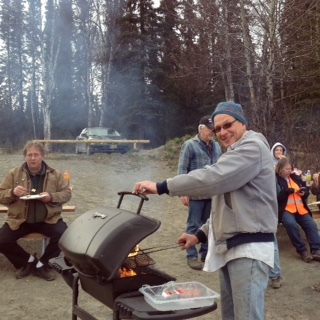 After the "clean up" everyone enjoyed a cook out. We have the greatest Rotary around! !